the yolks & whites separately & add the whites last. English Muffins or Crumpets Use the receipt for raised muffins, omitting the sugar & eggs. Do not bake them so much Turn before the crust becomes brown. When cold, pull them apart & toast them. 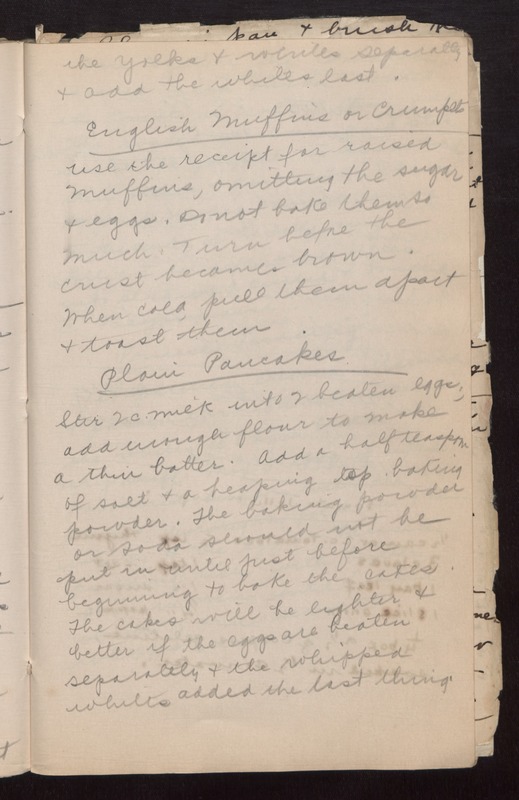 Plain Pancakes Stir 2 c. milk into 2 beaten eggs; add enough flour to make a thin batter. Add a half teaspoon of salt & a heaping tsp. baking powder. The baking powder or soda should not be put in until just before beginning to bake the cakes. The cakes will be lighter & better if the eggs are beaten separately & the whipped whites added the last thing.